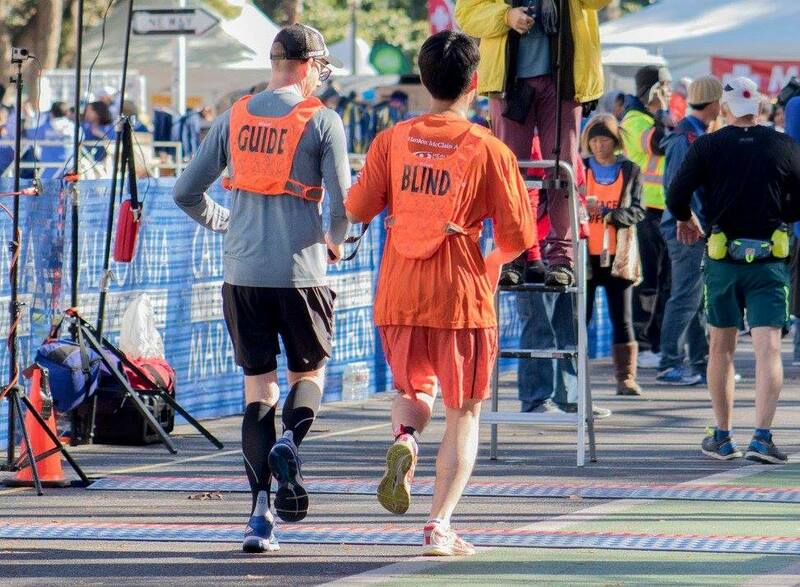 Since 2008, U.S. Association of Blind Athletes (USABA) has partnered with Sacramento Running Association to make the California International Marathon (CIM) inclusive for runners with visual impairments. This year, the group of more than 100 blind runners and guides includes military veterans, local runners, international runners and Paralympic athletes. It’s a weekend affair for this group of runners and guides with multiple community meals and gatherings where they’re able to mingle and get to know one another and culminates with an awards ceremony Sunday afternoon. USABA Sports Club and partner Sacramento Society for the Blind will host a dinner for runners and guides on Friday evening and Aira will host a breakfast for athletes the following morning. Runners will have a chance to explore downtown Sacramento with the CIM race expo with volunteers from local collegiate Delta Gamma chapters. On Saturday evening, athletes will attend a pre-race dinner and hear from fellow runner and founder of 2020 VisionQuest, Randy Pierce. On Sunday, more than 60 guides will lead nearly 50 runners on the course including 11 military veterans, three Paralympians and three international runners (from Canada and Belgium). Learn more about each of the runners here. This is the 10th year USABA has partnered with Sacramento Running Association (SRA) to host the USABA Marathon National Championships in conjunction with the California International Marathon. The partnership began in 2008 and has grown in number of participants each year. In addition to SRA, this event is made possible by title sponsor Hanson McClain Advisors as well as Aira, Delta Gamma, the Department of Veteran’s Affairs, The Gibney Family Foundation, Healthy Vision Association and Vanda Pharmaceuticals.